Improving firefighter safety and health by working cooperatively with our constituents through guidance, resource, investigation, inquiry and inspection. We assist fire departments in safety compliance and procedure issues. We answer questions from our citizens regarding rules, regulations and procedures regarding firefighter safety. We acquire firefighter safety information through research, experience, investigations, networking and safety organization membership. Information is disseminated through print, electronic media, presentations, seminars, courses, conferences and speaking engagements. Severe or fatal injuries or substantiated complaints will be investigated and report generated identifying facts, findings and recommendations. The purpose of an investigation is to identify the cause or causes that contributed to the occurrence, how to avoid reoccurrence and if a compliance inspection is warranted. Informal inquiries are used for less than severe or fatal injuries. The purpose of an inquiry is to identify cause and discover injury trends (11 to date). Inquiries are the cornerstone of our pro-active approach to safety and are shared both state wide and internationally. Any fatality or an injury requiring a hospitalization period greater than 24 hours must be reported to the Division of State Fire Marshal within 4 hours of the occurence. Inspections determine compliance with rule established safety procedures and requirements. Inspections result from an investigation, being a severe or high frequency of injury fire department, by fire department request or from a substantiated complaint. We work with the department balancing the desire for compliance and safety with the realities of time and resources. Assist in improving their safety, engaging personnel requiring safety committees and helping departments attain compliance with state safety requirements. While the information and recommendations contained in the Bureau of Fire Standards and Training (BFST) Safety Page have been compiled from sources believed to be reliable, the BFST makes no guarantee as to, and assumes no responsibility for, the correctness, sufficiency, or completeness of such information or recommendations. Other safety measures may be required under particular circumstances. 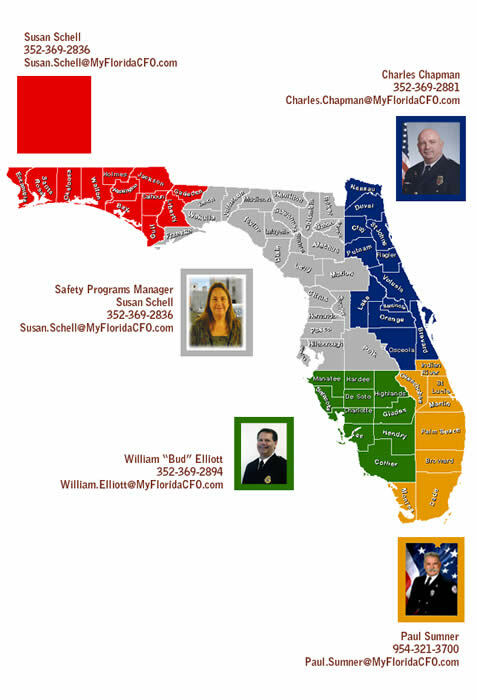 Links made from the BFST Website to another domain on the Web shall not represent an endorsement by BFST, the State Fire Marshal's Office or the Florida Department of Financial Services. All printed documents produced and provided by the BFST are in the public domain and may be copied without permission and may also be edited to fit the specific needs of the particular entity adopting the language for that entity's use provided the original intent and integrity is maintained.